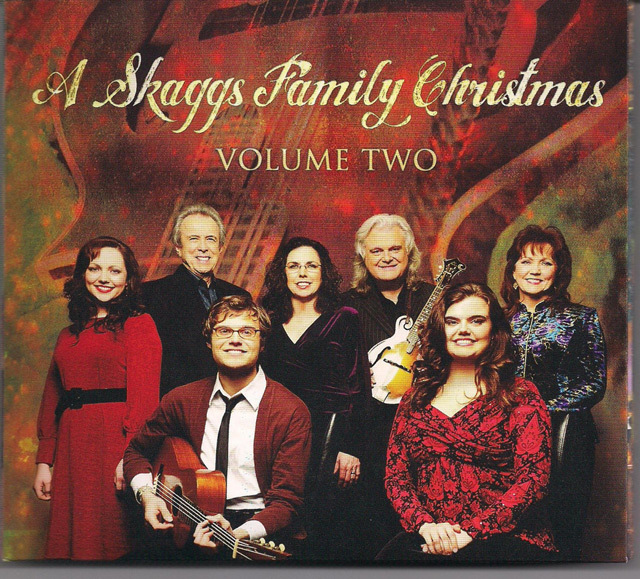 Six years after the release of the first Skaggs Family Christmas album, a tasty collection of a dozen sacred and secular carols, the whole clan returned, in 2011, with Volume Two of A Skaggs Family Christmas, an attractive triple-gatefold package containing a 10-song CD of studio and live performances plus an accompanying two hour-twenty minute DVD of the entire Skaggs Family Christmas Show, recorded live in Nashville and featuring Ricky, his wife Sharon White, his children Molly (now 27) and Luke (now 22), niece Rachel Leftwich, plus his in-laws, better known professionally as the Whites (Buck, Sharon and Cheryl) and Ricky’s esteemed band, Kentucky Thunder. Not the least of the CD/DVD release’s virtues is a suggested retail price of $14.99, which, in 2012, is down to $11.99. All the strengths of the first Christmas CD recommend Volume Two, and more. Molly and Luke, especially, stand out. Molly’s haunting piano-and-vocal treatment of John Jacob Niles’s “What Songs Were Sung,” a meditation on the wonder and enduring mysteries surrounding the Holy Birth, is tender and reflective, a spare beauty elevated to a mystical plateau by Molly’s crystalline, Alison Krauss-like cries. Luke, on lead guitar, energizes the proceedings with his spirited instrumental, “Flight to Egypt,” a driving workout bolstered by Andy Leftwich’s eager fiddling, Tom Roady’s propulsive percussion, Mark Fain’s steady bass, Molly’s empathetic piano and a silky backdrop courtesy the Nashville Strings, with Jim Gray conducting. Luke, Molly and Rachel team up on the album’s powerful penultimate number, “Oh Come, Oh Come, Emmanuel,” in a reverent, country-tinged arrangement featuring the young ladies in twin lead roles, their voices alternately intertwining and soloing, with Luke’s tenor bolstering the harmony. Concerning the revelation of Christ’s birth to mankind, this version of “Oh Come, Oh Come, Emmanuel” effectively concludes the CD as it precedes a closing instrumental coda of “Joy to the World,” a triumphant minute-and-half excerpt by the Nashville Strings. Ricky Skaggs and Kentucky Thunder perform ‘Let It Snow! Let It Snow! Let It Snow!’ at the Grand Ole Opry. This Christmas evergreen is featured on Volume One of the Skaggs Family Christmas album (2005). With a cast of thousands (okay, that’s a bit of an overstatement), the performance captured on the DVD is paced with a smart sense of the songs’ dynamics and messages, gives all participants multiple opportunities in the spotlight, and is edited unobtrusively to capture the show’s flow and energy. At 26 songs, it more than doubles the amount of music available on the included CD and would be a bargain, as the saying goes, at twice the price.